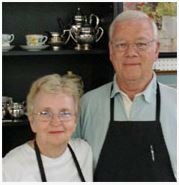 Chef Myrna and Host Pat Nesbit make every visit to Tea on the Mountain memorable. Whether you stop in for lunch, make a reservation for tea or book a catered party, you are in for special treatment and food beyond your dreams. Spotless white linens, fresh flowers and the unique China setting for each table give a different "feel" to dining at Tea on the Mountain. But it's the food that counts and that's where you can't go wrong, whether you choose Tea, a dish from the menu or one of Myrna's daily specials.